Shamit Khemka, regional director of Entrepreneurs' Organization, South Asia (2014-2016), Founder & Director of an IT company - SynapseIndia, and Co-founder of a food portal - Foodcloud. He has also been associated with International Chandramauli Charitable Trust and Yogamission Charity from a long time. Chosen as the mentor of Eternal Hindu foundation, Mr. Shamit Khemka will now impart knowledge to its Digital & Technical team of the foundation. Another initiative of the foundation - Shashwat Bharatam is fully supported by him. 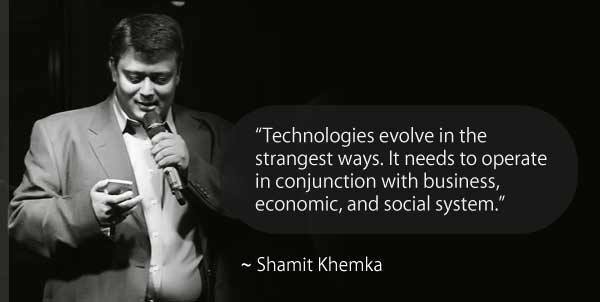 Shamit Khemka marked his presence at SURGE tech conference, widely acknowledged as the world's best technology conference. He considered SURGE as a great platform to meet with technology leaders from around the world and share new ideas. Every year, SynapseIndia team celebrates International Women's day. Shamit Khemka, founder of the company, is also committed to encourage women safety and advancement at workplace. He firmly believes that a great working culture lead a business towards success. He regularly motivates employees to come up with new and innovative ideas to solve problems efficiently.